I think a lot about issues of race, gender and class. I read about it and talk it over with people every week. I am working my way through an expensive program in order to write my dissertation about it. I care about matters of diversity and justice a great deal. Ever since talking to my mentor, Randy Woodley at Wild Goose West last fall I have been thinking about this a little differently. Then with the happenings of the Emergent Christianity thing in Memphis … I thought I would bring out what I have been whittling away at in my workshop. This is something I am working on and I would love your constructive feedback. The problem isn’t Brian McLaren speaking at a conference. The problem is if everyone speaking at the conference looks like McLaren. The problem isn’t reading a book by a white guy. The problem isn’t having a man speak up front at church. The problem is if we only hear men speak from up front at church. You don’t even listen to podcasts! Here is what I want to avoid. There was some grumbling on facebook when The Culture Cast was released and it turned out that both Jordan and Christian were white guys. Ironically, almost all the grumbling came from white guys – but that is a different issue. I suggested that since it was a concern of hers … why didn’t she tell us some recommendations. Why is she asking a question? She responded that she didn’t listen to podcasts. It would be like me complaining their aren’t enough black NACSAR drivers. I don’t watch NASCAR. I don’t even know how many black drivers there are. That reality is irrelevant to my existence. I think that we need to care deeply about things that we are invested in. There are too many issues that matter for too much for us to get tangled in controversies vicariously. We need to be careful of tokenism. Let me be clear on this: if you are group of white people who have organized a conference, already have 10 white speakers lined up and then think ‘we need some color – let’s see if we can get Randy Woodley’ … that is token. Randy got no say in the direction and organization nor had any power or influence. You just want to put a microphone in his face and have him do his schtick. Token is an afterthought that serves primarily to help one feel good about being able to check off a box. If Randy was on the organizing committee – trust me the no conference would look the same. Anthony Smith is an emergent voice and influence. He was in the movement before me and helped bring me in. That is not token. That is influence. Anthony Smith is influential. When Tripp and I organized the Emergent Village Theological Conversation we said “Monica Coleman is our marquee speaker, our cornerstone, our prima donna.” And we did not do anything until she agreed to be our first round draft pick. She got session 1 to start the conference to set the tone and she got session 5 to end the conference so that she had the final word. We built the conference around that structure. We then invited others to come in around her. When we inherited the Phoenix Big-Tent Christianity event many of the speakers were already in place. It was great to have Richard Rohr, Marcus Borg and Brian McLaren to boost ticket sales. But we wanted to highlight some voices that people had not heard a lot before. So, for instance, we structured the actual sessions that one of the ‘marquee’ voices was asking questions of one of the ‘emerging’ voices. For many people, that was the first time they had heard of Rachel Held-Evans. I will never forget watching her debate Marcus Borg about church folks understanding of creation! The problem isn’t that Mumford and Sons are all white guys. We have to look at the way that bands form. 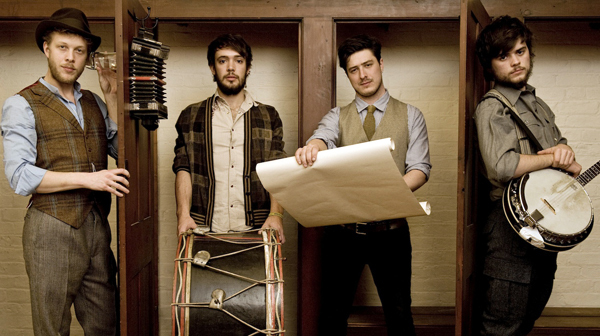 It makes sense that the guys of Mumford connect and play. The problem is if every band on the radio is white guys. The problem isn’t that Bono is a white guy or that U2 are all white guys. The problem is if every band on a record label is a bunch of white guys. We have to learn to distinguish between how a band come together and how the music industry functions. We also need to do this for church … and for christian conferences. I understand our desire for diversity – I just want us to manage our expectations. Our problem isn’t with Mumford and Sons, it’s with the music industry. The answer isn’t “add a black guy”. That is not how bands work. The problem then isn’t with any church, podcast, organization, conference or person. Our concern is with how that all comes together in a less-diverse way than we would hope for and desperately need. The answer then is not to ‘add a women and stir’ or to ‘get some color’. That is what we call token – and it is insulting to everyone involved. The need is to examine the bigger picture. This includes how things are planned, who makes decisions, and in what ways can people access resources. Here is a timely example: Tripp and I are singers and songwriters. Our friends Callid Keefe-Perry and Steve Knight are as concerned about the impact of technology on the church as we are. We have talking about it whenever we are together. We started this when we lived in 4 different parts of the country. Tomorrow, Steve Night is in town and we are going to record a podcast about the subject. That is not a problem. We are Mumford, or U2, or The Stones, or the Beatles … we are just a band. It is not a problem that we sing together – or in this case talk together. The problem comes if we are the only ones you hear.